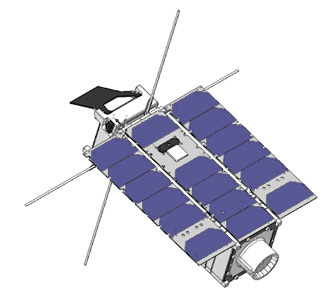 A 3U Cube Satellite, dubbed the HuskySat-1, is being developed by an interdisciplinary team at the University of Washington and will be launched into Low Earth Orbit to become the first amateur satellite from Washington state. This CubeSat will demonstrate the capabilities of new technologies being developed at the University of Washington and expand the capabilities of CubeSats as a whole. In particular, a high-thrust pulsed plasma thruster (PPT), and high-gain communications system will form the core technology suite on board the satellite. 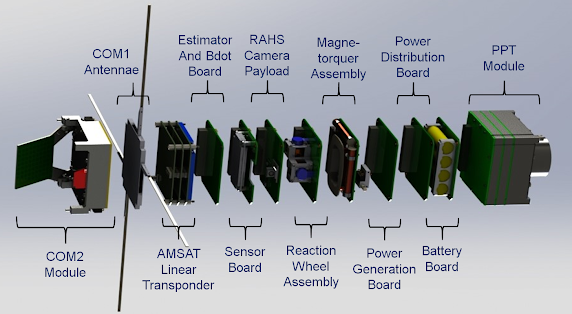 The majority of the HuskySat-1 is being developed at the University of Washington. The satellite is broken up into different subsystems. Each component is designed to be modular so that they can be most easily developed independently from each other and reused for future missions. 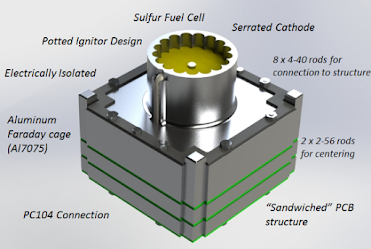 The Pulsed Plasma thruster will use tungsten electrodes and a sulfur propellant. HuskySat-1 will carry a 30 kHz wide 145 to 435 MHz linear transponder for amateur radio SSB/CW communications along with 1k2 BPSK telemetry. The satellite will also transmit BPSK telemetry at 1 Mbps in the 24 GHz band. The launch is planned for late 2018 with the ELaNA XXIV mission into a high inclination Low Earth Orbit (LEO).